​On August 5, seven members of the GCGS went on an exciting and educational trip to Elizabeth, Illinois. It was a beautiful day, blue skies welcomed us to this quaint little town, not far from Galena. Our first stop was the Apple River Fort visitor center. We watched a video depicting the history of Elizabeth. We learned that in 1832, a large group of Sauk and Fox Indians crossed the Mississippi River into Illinois. The settlers in the Apple River area were worried that they would be attacked, so a fort was built out of logs to help keep them safe. Black Hawk, a Sauk warrior, led about 200 Indians in an attack on the fort. Both men and women inside the fort fought back. Black Hawk decided that he was overpowered, so he ordered his troops to retreat. Three women, all named Elizabeth, were instrumental in protecting the fort. The Village of Elizabeth was named in their honor. ​After leaving the visitor center, we drove to the area where the fort had been located. A replica fort, complete with living quarters, welcomed us. Inside the fort, volunteers in period costume, were busy making candles from beeswax, roasting corn over an open fire, and sharing stories about the people who had lived in the area. We decided after sampling the delicious sweet corn, that it was time for lunch. We stopped at a charming little diner that served some very tasty paninis! Next on our agenda was a visit to the Banworth House and museum. Karl Banworth was from Baden, Germany. He came to the United States about 1867, and went to Hanover, Illinois. He became a blacksmith in Elizabeth, purchasing the Banworth house in 1876. He was married to Wilhelmina Himmelreich and together they had four children. Our tour guide was so wonderful, sharing stories about the Banworth family. Some of us tried on clothing from the time period of the Banworths. Bill Holland looked so dapper in his suit coat and top hat! Sharon tried on a spectacular skirt and blouse along with a very fancy hat! Very classy lady! By this time, it was getting late. We made a decision to return another day to visit the Great Western Railway Depot, along with all the other sights and shops located in the picturesque little village of Elizabeth, Illinois. Recently I found the proof I have been trying to find. My adoption record. I had clues that I was adopted but ignored them. I wondered why my birthplace was not near home or the fact that my mother was almost 50 when I was born and my father was 41. Everybody else had younger parents and were born at the hospital in Monroe unless they didn't live in Brodhead when they were born. My Dad was a one armed man who lost his right arm riding a motorcycle back in 1932. He did not consider it a handicap. I did not find out about being adopted until I was 32 years old. I had graduated from high school, went to college in Madison for 3 years and enlisted in the Air Force in 1963 and served over 3 years. I came back home and met my future wife and was married and we had our first son before I found out. In 1972 my mother had a stroke. She was 81 then and my father was by this time only barely able to walk so they were both moved to Monroe Manor permanently. When my folks went into the nursing home I found a letter referring to their adopted son so I asked my father and he said they just never found a good time to tell me. I was shocked and angry at them for awhile and then when I found about my birth family, I realized how blessed I was that somebody chose me and loved me and gave me a good environment to grow up in. I found out things would have been a lot worse in my birth family. So that was the seed that started me thinking about finding out who I was. Then several years later my mother-in-law said she thought she knew someone who could help me. She said I should see a friend of hers she thought could point me in the right direction. This friend lived in Brodhead and remembered going to reunions where there was story about a boy being adopted out and she thought that person was me. It turned the woman's family was related to me through my birth great grandmother. My relative sent me to Orangeville to find someone in my birth family. The first person I contacted did not want to tell me anything but they did suggest another name of a person in Freeport. That person turned out to be my birth mother's younger sister. She invited me in and over several meetings told that my birth name was Gross and that my mother was only 16 when I was born and was sent away to school for unwed mothers in Hustisford, Wisconsin because they did not want anyone to find out that their daughter was pregnant. When she came back, I was adopted out even though she objected. When she wouldn't agree, her mother committed her to a mental hospital where she spent the rest of her life. I did go and find her once before she died but all her memory had been wiped out by electro shock treatments. Even though I now knew all the facts, I was not content to stop there. By this time I had genealogy search bug deep within me. I researched my Abrams family information and continue to do so. I researched my adopted mother's Yarger family and found them to be Pennsylvania Dutch. I have researched my wife's family (Wild/Wilde) and her grandmother Feldt family and on her mother's side the Truax family. I now have researched birth records on the Gross family and Stamm family. The Gross family is also Pennsylvania Dutch as is the Stamm family. My research on the Gross family is the least proven of all records. I am an advocate to open records and complete honesty about adoption information. In the Abrams family I am aware of at least 2 other adoptions as well as my birth grandmother. I helped one of my Abrams cousins find twin stepbrothers who have welcomed her with open arms and don't know why their mother kept the information from them. After trying several times without success, I was able to get someone at Wisconsin Adoption Search in Madison to petition the court and obtain my adoption record and original birth certificate. Network. Ask relatives for information. Maybe they have already done some research. Check newspaper records, church records, and state historical society. Go visit relatives to learn more, even if they don't live close to you. Visit cemeteries and take pictures of gravestones. If all else fails and you think there may be facts in an area not close, consider asking for help. Contact a historical society or a library in the area. Hire a professional genealogy researcher but limit the cost you will pay. Salt Lake City Research or "Three Genealogists on a Road Trip"
​We started out from Monroe on May 18th at 8:15 AM, almost at the agreed time. We, being Evelyn Crooks, Ginny Gerber and myself, Donna Kjendlie. Everything was packed in the car with a little room to spare. Being moms, genealogists and knowing that we enjoyed food, we had a cooler and several bags of goodies. This was just to get us to Utah in the next three days. Along the way we would be stopping for lunch and then having a hot meal in the evening after obtaining a motel. We had “Sally” the Garmin, (sometimes known by other names), extensive directions from our hosts Sister Paula and Elder Lee Wright and a Rand McNally Atlas. Most of the time these worked out great for us. As it was beginning the summer vacations, we tried for an early motel at Seward, NE. It pays to check things out before retiring, however, we enjoyed a restful sleep after conferring with the clerk. Next morning after continental breakfast, (we are on a budget to eat as inexpensively as possible) and loading up the car, we take off toward our next destination, The Archway and Pioneer Village. Spending an hour there we learned more about the hardships of people when they moved westward. About halfway there, Ginny realized she had left her pillow at the motel. POINT: Put bright colored pillow case on pillow if traveling. Stopped at Brighton NE for the evening. In the AM, we took off again for Utah and stopped at Grizzly Park Rest Stop for lunch. That is when we realized that Evelyn and I had left our jackets at Brighton. POINT: Don’t hang things in a closet if you can’t remember to check it out. We arrived at the Wrights on May 20th at about 6:45. She had a light supper waiting for us to enjoy. Lots of exchanging of news and laughter. Finally, we are going to get to do some research. Today we drive from Mt Pleasant to Salt Lake City in two hours. Then find a parking place and walk to the Family History Library. It is amazing and overwhelming. So much to see and decide what direction we wanted to go. The Wrights were going to scan photos so they were off to do that. After talking to some of the helpful staff, we each went our way to find our answers. We all had done some pre-planning but found that the more answers to questions, we found more questions to answer. No big breaks but will wait impatiently for Monday and Tuesday. We enjoyed seeing the beautiful buildings near the library and walked through a large mall to the food court for lunch. One must be prepared to walk, walk, walk. Back to researching for a few more hours and then headed home to rest our eyes and brain. Provo has a fantastic buffet, “Chuck A Rama” so we refueled our bodies and continued heading back to the Wright’s. It should be noted that we were up about 6AM and went to bed around 10:30 or 11. We had amazing accommodations at the Wright’s with each of us having our own room. They have a beautiful home. Sunday, they invited some of their friends to have dinner with us and we enjoyed grilled wild turkey, potato salad and strawberry shortcake. Yummy!! Monday was back to research. We are pros now and know just where we want to go so we wander around a bit trying to decide which project we want to start. I had been up in the books as I can’t read microfilm as the other gals were doing. Again the staff is very helpful. It was an advantage for me as I had spent considerable time going through the card catalog at home. I concentrated on Pennsylvania as I am trying to confirm my great-grandfather’s father’s name. Evelyn was concentrating on German and eventually Ginny worked on Canadian. We all found some things but nothing concrete. Tuesday, our last day, Ginny hits it big by finding a book with her family in it so she is busy copying pages. Evelyn finds a town in Germany which is now in Poland. I still don’t find out the name of my gggrandfather but did ​find lots of things to pursue in Pennsylvania. All in all it was a fantastic, awesome, exciting time to see and work at the library. The people were always there to help or find someone that knew more. Our last day in Utah was spent traveling to Bryce Canyon which is about 3 hours south of Mt Pleasant. I had received a photo of the canyon from the Wrights and I mentioned that if I ever had the opportunity I would like to see it. Words cannot describe the beauty at 8100 feet. We made it to the top and Lee had kept track of our steps. 6300 going up only. They took pity on me and Paula went and brought the car around for a shorter walk down. I am very glad that we were able to do some tourist shopping there also. I love rocks and gems and had a great time at Ruby’s Rock Shop. We got to see some other beautiful buildings both inside and out while in SLC and around the areas. A beautiful place indeed!! ​Alas, time was up and on Thursday, we started home. We only left a small bottle of milk at one of the motels. In our travels we enjoyed seeing mule deer, antelope, lots of sheep, wild horses and even an elk (so what if it was only a big metal one,lol). A lifetime experience for all. ​Good morning Judy! I am so sorry to be so slow in sending this on. It's been one thing after another. I thought the "funeral" program on the 2nd was wonderful, very informative. Who would have thought you could learn so much from the pictures, truly the now 'unhidden' messages of the time! 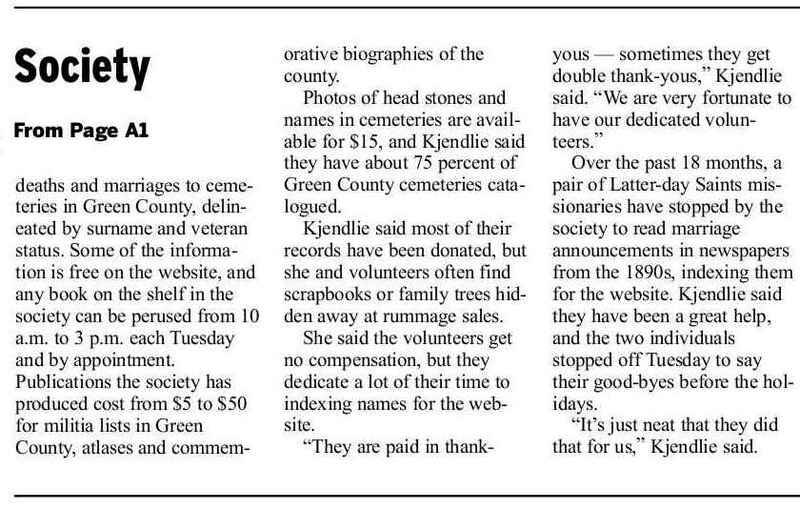 My success story is attributable to the great assistance you gave me and the valuable work done by the Green County Genealogical Society. As I was working "up the tree" on my paternal grandmother's side last summer, I came upon my great-great-grandmother's name and then her grave, never realizing she was buried in Evansville, WI. I've driven past the sign a million times, never realizing I had an ancestor buried there. Susan Helen Bowman Olson Warner was born 1856 (or 1858) in Green County, WI and died in 1940 in Argyle, WI. Buried in Evansville with her second husband and two sons (all who proceeded her passing), I found that her small marker had the birth year engraved but no death year recorded. I suspect with times being hard then (end of the depression/start of WWII), the engraving was not as urgent as other day to day needs--and then, likely lost to time. So I decided to get the stone cleaned up and engraved. Not having "proof" of the year of death, I came to ya'll one day and you helped me locate her obituary from the newspapers. I found she died in December of 1940 (winter being another possible reason the engraving wasn't done at the time). Having the 1940 year confirmed, I was then able to proceed to contract an engraver to finish her stone. Thus 75 years and 5 generations later, the stone is now finished. This endeavor has made me appreciate all the more that for those of us who love genealogy our family story is always an on-going "living" story. I'm glad I found her. I'm glad I was able to finish her stone. And I'm so grateful for your help and the work done by the GCGS, I can't tell you. I pray the little ones coming up in my family will carry the same appreciation for genealogy as ya'll so wonderfully support.